11.1882: Launched by W. Walker & Co, Deptford (Yd.No.) for Robert Middleton (64/64), Leeds, as ALBATROSS. 9.2.1883: Registered at Scarborough (SH37) (Sk.George Bowles). Robert Middleton designated managing owner. 6.11.1884: Owned by Robert Middleton & Stephen Todd Holdroyd, Leeds; Joseph Henry Holdroyd, Leeds and Thos Allen, York. 13.11.1884: Owned by Robert Middleton & Stephen Todd Holdroyd, Leeds; Joseph Henry Holdroyd, Leeds: Thos Allen, York: Wm Holdroyd, Scarborough and William Arthur Mallinson, Leeds. Robert Middleton designated managing owner. 12.11.1884: Owned by Robert Middleton & Stephen Todd Holdroyd, Leeds; Joseph Henry Holdroyd, Leeds; Thos Allen, York; Wm Holdroyd, Scarborough; William Arthur Mallinson, Leeds and William Mallinson (7/64), Huddersfield. 31.12.1884: Owned by Robert Middleton & Stephen Todd Holdroyd, Leeds; Joseph Henry Holdroyd, Leeds; Thos Allen, York; Wm Holdroyd, Scarborough; William Arthur Mallinson, Leeds; William Mallinson (7/64), Huddersfield and Henry Lambie Woodger (6/64), Scarborough. 29.4.1887: Henry L. Woodger shares (6/64) sold to William Woodger, Newcastle. 23.4.1888: At the Mercantile Marine Office, before Mr Cumberland, Collector of Customs, George Reynolds, cook, sued the skipper for wrongful dismissal. On 19th last Reynolds was discharged and the skipper refused to pay him his wages. After hearing evidence Mr Cumberland made an order of 9/4d. 28.11.1888: Ran into Fish Quay at Hartlepool doing considerable damage. 10.3.1891: Sailed Scarborough at 4.30 am. for the fishing grounds. Disabled after boiler manhole cover blew off and lost steam. Returned to Scarborough under sail. 26.4.1892: Sold to George Rookin Nicholson (64/64), Liverpool. 5.1892: Extensive alterations and overhaul. New steam winch by Messrs Rogers & Co, Stockton, new side rollers, dandy scores, raised forward and iron bulwarks fitted all round. New masts and sails. Total cost £800. 5.1892: Registered at Liverpool (LL184). 1892: Sold to “Albatross” Steam Ship Co Ltd (64/64), Liverpool. Henry H. Grayson, Birkenhead designated manager. 18.3.1893: Advertised for sale in the Aberdeen Journal by Frederick Aspinall, Liverpool. Vessel is fully found in every respect with new 200 fathom 3.5” steel wire warps and two full and complete sets of fishing gear. Presently fishing out of Aberdeen. 9.1893: Sold to Robert Knox (64/64), Douglas, IoM. 2.10.1893: Registered at Douglas (DO246). Robert Knox designated managing owner. 6.11.1894: Trawling off the Bahama Bank (Sk. Edward Shimmin); eight crew in total, in company with LADY LOCH (DO20) (Sk. William Shimmin) some half mile apart. In the early hours about 1.00am. with the skipper at the helm, observed the lights of a steamer bearing down on them. Sounded the steam whistle but unable to manoeuvre with the trawl down. Struck amidships and almost cut in two by the L&Y and L&NWR steamer DUKE of CLARENCE (1489grt/1892), Belfast for Fleetwood and foundered quickly. The skipper gained the forecastle of the steamer by way of the funnel stays and two men were picked up from the water, by boats from the DUKE of CLARENCE. 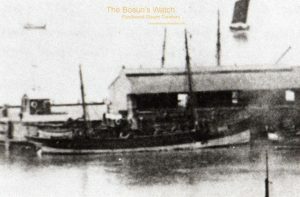 LADY LOCH closed the scene and started to search for other survivors, joined later by steamers MANX QUEEN (989grt/1880) and DUKE of YORK (1473grt/1894). After three hours the search was abandoned; five crewmen unaccounted for, believed drowned. Survivors landed by DUKE of CLARENCE at Fleetwood. 17.11.1894: Douglas registry closed. Wreck lies 9.5 miles SE of Ramsey. 2.1895: In the Admiralty Court a claim for damages in lieu of the loss was heard. The findings were that the master of the DUKE of CLARENCE was at fault in that he failed to post adequate lookouts and disregarded the numerous fishing vessels, some thirty in number, on the fishing grounds. Damages were agreed and John Knox received an undisclosed sum. (Albatross was valued at £2,000 but insured for £12,000). The families of the lost crewmen received: Widows of William Dougherty, Henry Hudson and Richard Gregg – £300 each; the families of Hudson and Gregg received £150 each; the seven children of Dougherty received £250; the father of John Leadbetter received £250. Lost: William Dougherty, Mate; Henry Hudson, Ch Eng; John Leadbetter and Richard Gregg, Deckhands and Charles Shimmin, nephew of the skipper, son of skipper of Lady Loch, Fireman. Survivors: Sk. E. Shimmin, R. Kelly, 2nd Eng and Thomas Lawrence. 27/11/2018: Image added. Information updated. 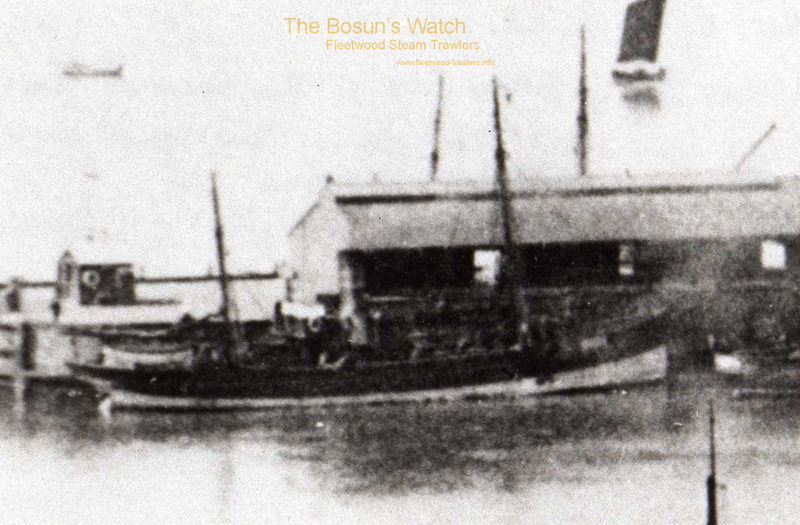 This entry was posted in Lost Vessels, Steam Trawlers, Steamers (Picture) on November 24, 2018 by Fred Smith.